Jumper setting does matter, especially if it's a Western Digital. If you stick the HD on the end of the cable, it still has to be set as either Master or CS. If it's stuck on the middle, it still has to be set as either Slave or CS. For some drives it doesn't matter where on the cable it's connected, IBM's were like that, but for other's it matters. Western Digital also has a special setting if it's a stand alone drive. The only brand that has such a setting. If it's a Western Digital the jumper ABSOLUTELY has to be in the factory default setting. The jumper should be across pins 8 and 9 IF it is a standalone drive. That IS the setting for WD's. WD's should only be set to master/slave if another drive is on the same IDE cable with it. robbie, is this drive now happily integrated into the XP box?? I don't know what specific version of XP you are using...there are many now. I had XP Home, Pro and Corporate all installed on the drive when it was a FAT32 drive previously. i'm talking brand new drives, and i have xp pro...and why would you wanna triple boot XP??? Windows XP, Windows 2000, Windows Me, Windows 98, and Windows 95 OSR2 can access FAT32 volumes. 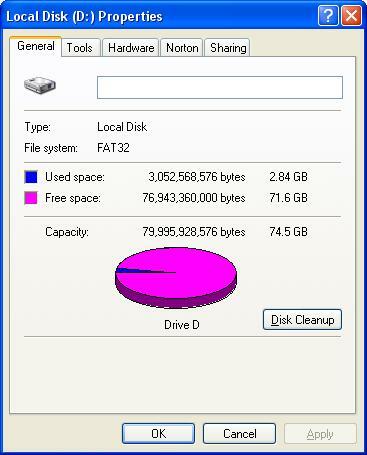 MS-DOS, the original version of Windows 95, and Windows NT 4.0 do not recognize FAT32 partitions, and are unable to boot from a FAT32 volume. Also, FAT32 volumes cannot be accessed properly if the computer is started by using another operating system (for example, a Windows 95 or MS-DOS boot disk). Last edited by [Dark]; 10th December, 2002 at 03:57 PM. Another option is to start from a Microsoft Windows 98 or Microsoft Windows Millennium Edition (Me) Startup disk and use the Format tool included on the disk. I posted my reply to help others, as what you posted above isn't really true. We try to help folks sort out problems by offering solutions. Glad we got this sorted out and I hope your problems are gone as well. as what you posted above isn't really true. I'm glad you set aside this special time to humiliate yourself. Funny. Was wondering when I could finally use that line.